Sorry for the facade shot, I was in a hurry to go in. Welcome to Wee Nam Kee! For those who have already dined here, the restaurant probably needs no introduction. 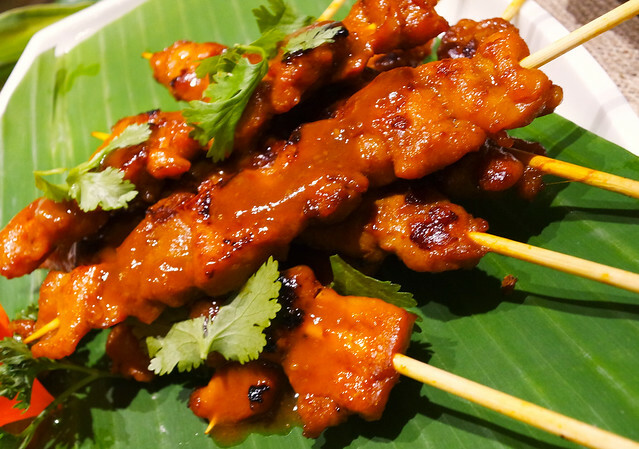 This is Wee Nam Kee, a Singaporean themed restaurant from our friends from the Relish Group. 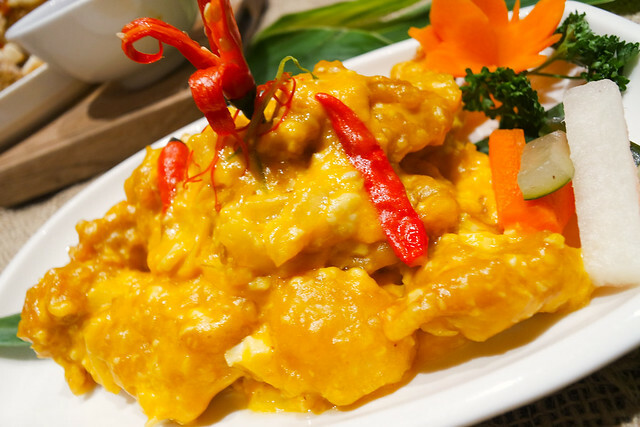 They serve hearty Singaporean dishes which you would probably miss if you've already been to Singapore. I don't know if there's already a survey but from what I know, this restaurant serves one of the best versions of Singapore's Hainanese Chicken Rice. 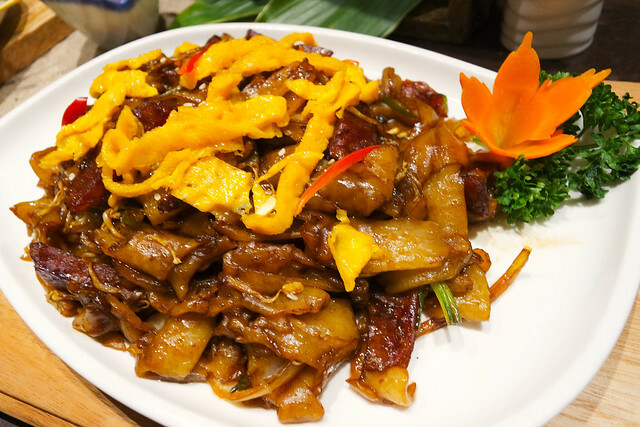 Though aside from their best sellers, they've come up with 4 new dishes so you could get to enjoy MORE when you dine in a Wee Nam Kee restaurant near you! First up is the Laksa Lava Fish Cake. 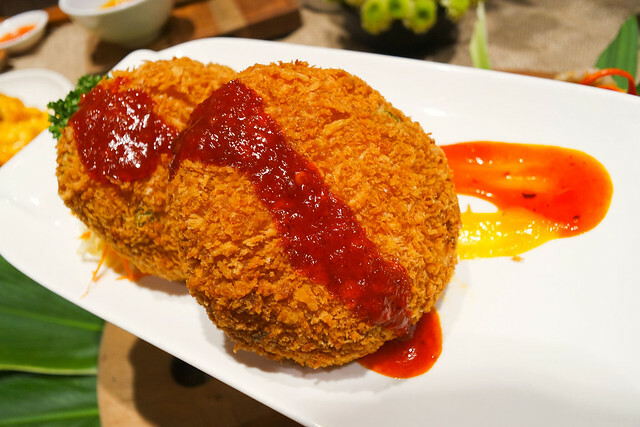 It's you not so usual fish cake this time as it has the Laksa flavor profile on it. 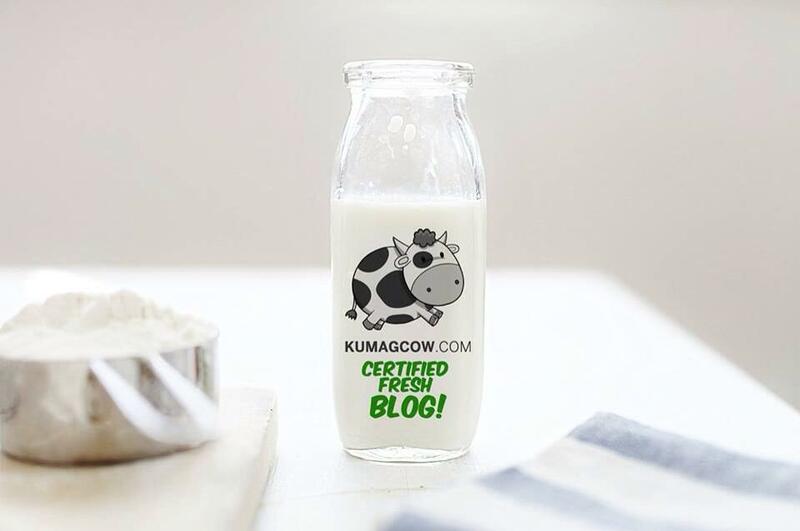 So make sure you're ready for hints of coconut milk, chili, ginger, all in one bite. It is served as 2 cakes, for Php 195. Pretty spicy, but I'd have this instead of the usual one. I like the kick a lot. This one is the Beef with Peach Mint Sauce. 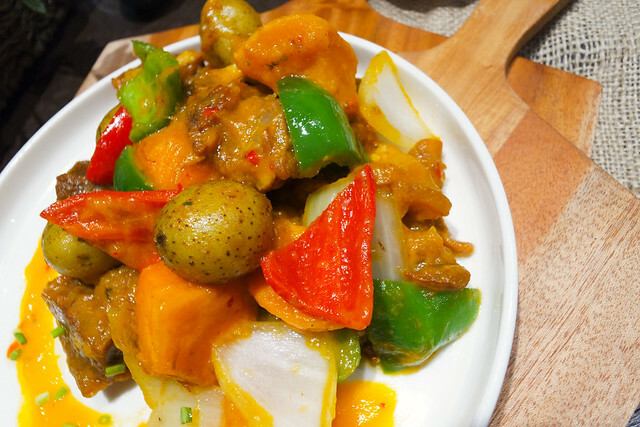 As the name suggests, it's got shards of Beef strips, pureed peach fruit made into a glaze (served on the side) and a couple of bell peppers, onions sauteed with the potatoes and beef plus some ribbons of mint mixed in which had it produce a hint of its flavor. This would be a good alternative if you're a little too tired of Beef and Broccoli. You probably have had Cereal Prawns if you have gone to Singapore, but I'm sure you haven't had Cereal Soft Shell Crab yet. The concept is simple, it is like the former but they use seasonal Soft Shell Crabs. It's that melt in your mouth, all crispy crab which I don't usually see in the Philippines but apparently they've already tapped a supplier that may get us the chance to have this during the holidays. That's good news, especially for those who tend to be addicted to it at first bite. I could already taste it! 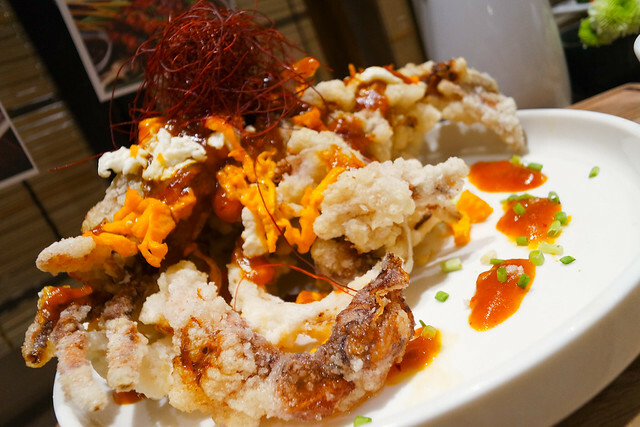 Chili Soft Shell Crab sounds so right too! 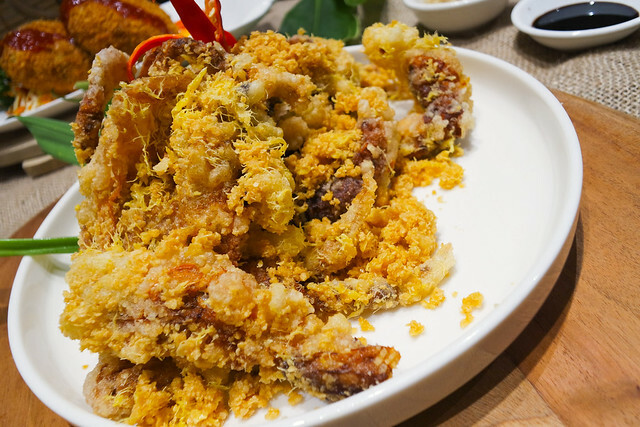 It's basically just the usual fried to a crisp battered soft shell crab with streaks of chili sauce on the plate plus a couple of slices of onion rings. It's meant to be eaten together but if you prefer to just set it aside, that can be done too. I love onion so I'm not making excuses! The soft shell crabs are a bit pricey though at Php 658 for 2 pieces per serving. Although if you love crabs, it's all worth it! 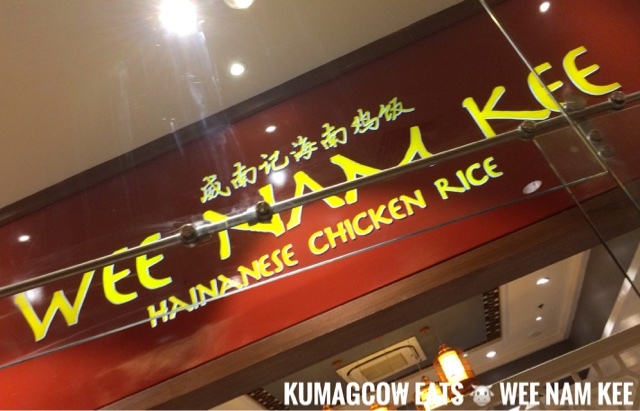 They still have your usual suspects, like the recommended Hainanese Chicken Rice, the Salted Egg Fried Chicken, the Char Kway Teow and Satay. All unbelievably affordable and can be seen in one place, thanks to the Relish Group for having us at their Promenade Greenhills branch the other day so we could try these all before it got sold to the public. It's now available on all their branches, so go ahead and indulge because Singapore food need not to be in Singapore at all! I'm going back for the Soft Shell Crabs though, I better be careful and make sure it won't get my blood pressure high! Haha!